Some domestic violence victims are encouraged about the progress of a bill that would take guns away from abusers who face permanent protective orders. Both the House and Senate versions of the bill took another step forward Friday in the Virginia General Assembly. The proposed measure is part of the compromise gun law plan announced recently by Gov. Terry McAuliffe and Republican leaders. Activists on both the gun rights and gun control sides have weighed in. A domestic violence survivor who broke free from her abusive husband nine years ago told News4 the abuse began first with verbal threats, then escalated. "It started as yelling, threatening," she said. "It progressively got worse. He came home from drinking and got into a physical altercation and I ended up with a slice under my eye." More incidents followed until her husband was arrested and went to jail for hurting her. When he was released, she hoped to reconcile only to be injured again and again. One day when she answered a call from him, she hid a weapon they had in the home. "Whatever it was, something in his voice, and I knew I had to hide the weapons that we had," she said. "I hid them so he couldn't get them because I honestly feel if he had been able to access those, I probably would have been dead that day." The final 911 call that led to more jail time for her husband came when when their 2 1/2-year-old daughter witnessed an attack. "He was throwing me up against the wall, pushing me on the ground, and she was yelling, 'Daddy no, Daddy no!' That's when I decided, That's it, you're never going to put your hands on me again." 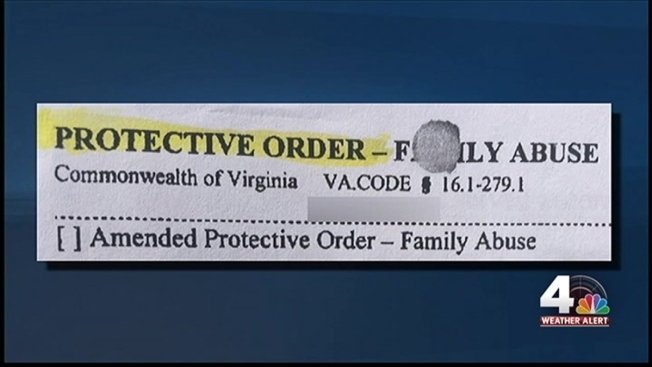 She got a permanent protective order against her husband -- which lasts for two years -- and she got help from Fairfax County Police's Victim Services Section. Now, she says she welcomes the proposed legislation that would require abusers under permanent protective orders to sell or surrender their weapons. Right now, protective orders only bar the accused from purchasing or transporting a firearm. "It's nice to know," she said. "It seems to me anyway they are looking at the survivors, trying to make the survivors more comfortable. It's a little late for the victims because some of them have probably already lost their lives to the violence of guns so I definitely think its a step in the right direction." The gun violence prevention group Everytown for Gun Safety has been critical of the proposed legislation, complaining that it has no explicit language that would require abusers to surrender their weapons. Right now in Fairfax County, almost 270 permanent protective orders have been issued against domestic abusers. Sandy Bromley, who coordinates services for Fairfax County's Office for Women & Domestic & Sexual Violence Services, also welcomes the change in the law. "The impact of this new legislation will be really amazing for victim safety," said Bromley. "What we want to make sure of is we are reducing their risk of homicide so just getting guns out of the picture in cases when violent is already in the home is the most important thing." She said statistics show when there is a gun in the home, a domestic violence victim is 500 times more likely to be killed than when there is not a gun present. But Fairfax County isn't waiting for the new legislation. It's already made a big change to try to change lives. In July, the county launched LAP: The Lethality Assessment Program. It's modeled after a program that's been in effect in Maryland for years. Fairfax County Police officers got special training and now when they make an arrest for domestic violence, they must ask 11 questions of the victim. The first, has he/she ever used a weapon against you or threatened you with a weapon? If a victim scores high risk they are immediately connected by phone with a staffer in the county's Domestic Violence Services Office, who will immediately arrange for safety planning or an emergency shelter. Bromley is encouraged by the early results. "It's been huge," she said. "So far we've had no domestic violence homicides in the seven or eight months since we've had the program going."